We were scheduled to depart to Grand Bahama in mid November, on the tail-end of the worst hurricane season on record. Unfortunately for us, Grand Bahama was still recovering from a direct hit by a hurricane that tore apart the island. Only 2 days prior to departure, we were not certain if our flight would depart and where we would stay (apparently our booked hotel had taken the worst hit of all). With no time to spare, I booked a different hotel, confirmed dive reservations and off we went. This was a boys trip including my brothers and some close friends. Our objective was simple, mix it up with as many caribbean reef sharks as possible by participating in several organized shark feeds. The rest of the dives were really just time fillers. We found the dive sites on Grand Bahama so-so for the most part. With the exception of the wreck which was well worth the effort, the dive sites were uninspiring and lacking in both corals and reef-life. A reef shark here and there dropping in to check us out served to spice things up on occasion. Our money was on the shark feeds. Pure shark adrenaline from start to finish. I know some folks take issue with shark feeds and the impact they are having on the sharks behavior. In my mind they clearly have an impact. However, my stance is quite simple. Hundreds of millions of sharks are being slaughtered each year for shark fin soup, their jaws, teeth, as by-catch and for sport. The only sharks that have a chance of surviving are those that create economic value for the local population. Shark feeds create incentives to keep the sharks alive because they are worth more alive then dead. If behavior modification is the only way to keep them alive, well so be it. Back to the shark feeds…wow! We had great time with sharks darting this way and that. The feeder was inundated by these hungry yet surprisingly gentle creatures. 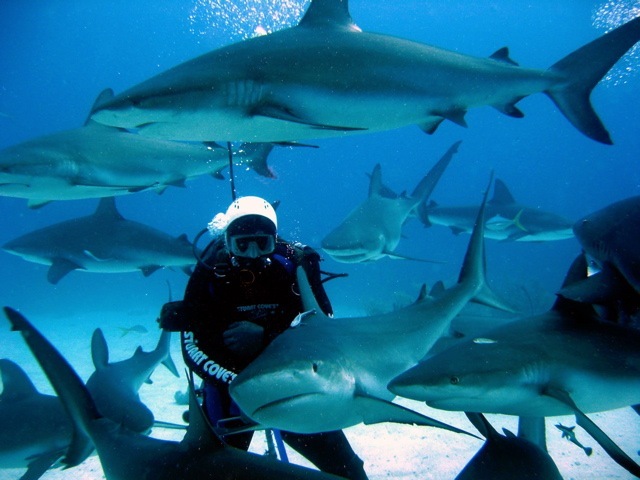 Sharks were everywhere…between us, above us, bumping in to us…swarming. I did my best to enjoy the experience while capturing the action with clenched fists!